High-quality tape measure featuring two different attachment options—a simple belt clip or a carabineer. 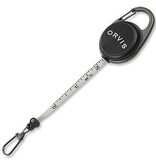 The zinger itself also functions as a measuring tape made from a high quality waterproof polyester material. Sturdy clip on the end of the zinger holds your tools. Both US and metric measurements. Black nickel finish. 40" tape length.